TOP: Surfers take advantage of Lake Michigan’s waves. 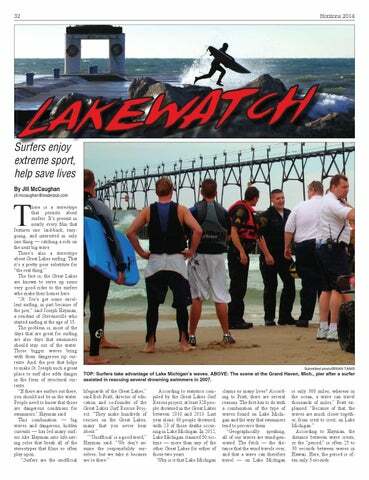 ABOVE: The scene at the Grand Haven, Mich., pier after a surfer assisted in rescuing several drowning swimmers in 2007.
is only 300 miles, whereas in the ocean, a wave can travel thousands of miles,” Pratt explained. “Because of that, the waves are much closer together, from crest to crest, on Lake Michigan.” According to Hayman, the distance between wave crests, or the “period,” is often 25 to 30 seconds between waves in Hawaii. Here, the period is often only 3 seconds.